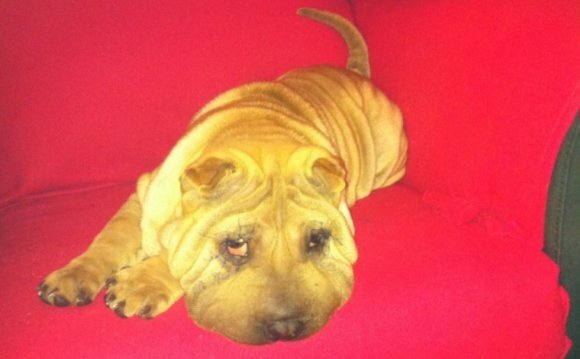 Familial Shar-Pei Fever (FSF) is a hereditary inflammatory disorder seen in Shar-Pei. It appears to be inherited as an autosomal recessive condition. Clinical signs: Episodic fever is the most important and consistent clinical sign of this disorder. The temperature commonly is in the 105-107°F range. The fever is generally self-limiting lasting 12-36 hours. Another common clinical sign often accompanying the fever is swelling of a joint, usually the hock (tibiotarsal) joint and is known as Swollen Hock Syndrome (SHS). This painful, hot swelling can also involve the carpus (wrist) and the lips. Dogs with FSF are sick - they are reluctant to move and when they do walk they have a characteristic "walking on eggs" gait. They often are painful in the abdomen and have a characteristic "roached" back. There can be gastrointestinal signs such as mild vomiting and diarrhea as well. The major function of the immune system is to recognize "SELF" and "NONSELF" and then react appropriately to eliminate the "NONSELF" antigens. There are two arms of the immune system - INNATE IMMUNITY and ADAPTIVE (HUMORAL) IMMUNITY. The innate immune system is set up to react quickly by generating an inflammatory response. The adaptive immune system is slower in onset and has the advantage that it "remembers" previous encounters. Hence it "learns" and reacts quicker and stronger in future episodes. Both these legs work together to lessen the impact of bacteria, foreign material, viruses, fungi, tumor cells, etc. on the body. Inflammation is a normal response in the body and is finely controlled by a "checks and balances" system which regulates the duration and intensity of the response. There are systems in place which turn "ON" the system and turn "OFF" the system to maintain balance. A genetic defect in the innate immune system can lead to uncontrolled inflammation resulting in AUTOINFLAMMAORY disease - a syndrome of continuous (constant "ON") inflammation which is not healthy. A genetic defect in the adaptive immune system leads to an over-reactive immune response resulting in AUTOIMMUNE disease (the body reacting to itself).